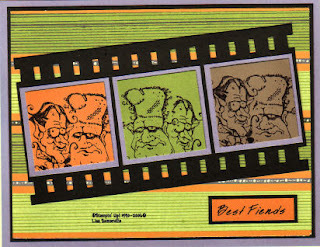 On this card I combined the Filmstrip and Warhol Techniques both from past issues of the Technique Junkies Newsletter. This is so adorable, Lisa. I love how you masked them together so they would be in one frame! Awesome...I love it! Your card is gorgeous girl !!! I loved that set and have hung on to it!!! Love the colors and the Warhol look, great card!